Objective To evaluate the effects of a home intervention and ongoing maternal drug use on the developmental outcome of drug-exposed infants. Design Longitudinal randomized cohort study of a home intervention with substance-abusing mothers and their infants. Mother-infant dyads were randomly assigned to a control or intervention group at 2 weeks' post partum. Control families received brief monthly tracking visits. Intervention families received weekly home visits from 0 to 6 months and biweekly visits from 6 to 18 months by trained lay visitors. Participants One hundred eight low-income, inner-city, drug-exposed children (control, 54; intervention, 54) who underwent developmental testing at 6, 12, and 18 months post partum and who remained with their biological mothers through 18 months. Main Outcome Measures Infant scores from the Bayley Scales of Infant Development (BSID) at 6, 12, and 18 months post partum. Maternal report of drug use during the pregnancy and ongoing drug use through 18 months post partum was assessed. Results In the repeated-measures analyses, intervention infants had significantly higher BSID Mental Developmental Index (MDI) and Psychomotor Developmental Index scores than control infants. Ongoing maternal cocaine and/or heroin use was associated with lower MDI scores. Finally, MDI scores decreased significantly in both groups. Conclusions Ongoing maternal drug use is associated with worse developmental outcomes among a group of drug-exposed infants. A home intervention led to higher BSID scores among drug-exposed infants. However, BSID MDI scores decreased during the first 18 months post partum among inner-city, low-socioeconomic-status infants in the present study. Home and center-based interventions are often used to help improve developmental outcomes among drug-exposed children. A home intervention program12 and a combined home and center-based intervention3 led to higher infant cognitive scores compared with control infants at 6 months, but there were no group differences at subsequent visits. Thus, intervention programs are associated with higher cognitive scores among drug-exposed infants, but it is not clear if the effects last beyond the first year. The purpose of the present study was to determine if a home intervention and ongoing maternal drug use were associated with infant developmental outcomes among a group of inner-city, low-socioeconomic-status, drug-exposed infants who remained with their mothers through 18 months post partum. Participants were selected from a larger population from an ongoing longitudinal randomized study among drug-using women and their infants. They were recruited from the full-term neonatal unit of the University of Maryland Hospital, Baltimore, which serves a largely inner-city, African American population. Infant and maternal medical records from the unit were screened on a daily basis (except Saturday and Sunday). Mother-infant dyads were eligible for recruitment if the infant and/or the mother had a positive urine toxicology screening result at birth. If both the infant and mother had a negative urine toxicology screening result but there was a history of drug use during the pregnancy noted in either medical record, the mother-infant dyad was also eligible for recruitment. Infants who were not being discharged into the care of their mothers were not eligible. Infants who had serious developmental or congenital problems that required special services (eg, spina bifida) were not eligible because these services often included a home-visiting component, which would have interfered with the randomization in the present study. Of the 373 women who were approached, 115 declined to participate. Mothers in the control group received brief monthly home tracking visits from birth to 18 months post partum to reduce attrition. One full-time, African American woman was hired to make these visits to the control families. The visitor had a high school diploma and was chosen based on experience working with poor, inner-city families. A 1-page contact form was created to keep the control visits as short and structured as possible. The contact form included the following: visit date, time in the home (minutes), who had custody of the study child, if the mother or child were in any programs, date of the child's next physician visit, and whether the family was moving soon. The visitor left after completing the form. The mean number of home visits made to the control families during the first 18 months post partum was 6.6 (SD, 4.7; range, 0-17), and the mean length was 18.8 minutes (SD, 5.7 minutes). The control worker met with a psychologist and pediatrician for bimonthly supervisory meetings. Mothers in the intervention group received weekly home visits during the first 6 months and biweekly home visits from 6 to 18 months post partum. Two full-time, African American women were hired to implement the home intervention. The visitors were chosen based on their experience with home visiting, their commitment to helping poor, inner-city families, and their sensitivity. The visitors shared the caseload of intervention families, but each visitor was assigned to specific families. The mean number of home visits made to the intervention families was 19.0 (SD, 13.0; range, 0-57), and the mean length of the visits was 27.6 minutes (SD, 4.8 minutes). The intervention visitors met with a psychologist and pediatrician weekly to discuss concerns and track the progress of the families. The intervention protocol has been described previously13 and is summarized herein for clarity. The home intervention was developmentally oriented and was based on the Infant Health and Development Program (IHDP).14 The original IHDP had 3 components: home-based intervention during the first year, child attendance at a child development center, and parent group meetings starting the second year post partum. The intervention mothers in the present study did not participate in the child developmental center or parent group meetings. Therefore, the focus in this article is on the home intervention program and infant cognitive outcome through 18 months of age. The home intervention had both a parent and infant component. The IHDP was not focused on drug-using parents; therefore, information about drug use and drug treatment was added to the content of the home intervention. The goal of the parent component was to enhance the mothers' ability to manage self-identified problems by using existing services and family and social supports. The topics covered during the maternal component included housing, public assistance programs (eg, Supplementary Nutritional Services to Women, Infants, and Children), partner abuse, the effects of drug use, and drug treatment. To establish consistency in the content of the home visit, a personal contact form was created. The contact form documented the time spent with the family and the content and quality of the contact. The goal of the infant component was to promote infant development using a program of games and activities. The home visitors used the HELP at Home: Hawaii Early Learning Profile,15 which is a comprehensive curriculum containing 650 age-specific developmental skills for infants from birth to 36 months of age. Based on the age of the infant, the home visitors would model an age-appropriate developmental skill for the mother. An activity sheet that accompanies each developmental skill was given to the mother as a guide to help her learn about child development. At each visit, the visitors would focus initially on the parent component, then focus on the infant component. At the 2-week baseline visit, mothers were asked about their use of cigarettes, alcohol, heroin, cocaine, marijuana, amphetamines, barbiturates, tranquilizers, and hallucinogens during the pregnancy. Mothers were asked if they had ever used each drug, the last time they had used each drug, and how frequently they used each drug in the last 6 months. This same drug form was administered to the mothers at 6, 12, and 18 months to assess ongoing drug use. Infant developmental outcome was assessed using the Bayley Scales of Infant Development (BSID).16 By the time the BSID II became available in 1993, the BSID had already been administered to the oldest infants in the study at 6, 12, and 18 months. To prevent test version from being confounded with outcome, the BSID was administered to all the infants through 18 months post partum. The BSID yields 2 scores, a Mental Developmental Index (MDI) and a Psychomotor Developmental Index (PDI), both of which have a mean score of 100 and an SD of 16. The BSID was age-corrected for premature infants. Eligible mothers were approached in the hospital shortly after giving birth. Mothers who agreed to participate signed a consent form approved by the institutional review board and completed a short demographic and tracking form that was administered orally. Perinatal data were collected from infant medical records in the nursery. At the 2-week baseline visit before randomization to group, maternal report of drug use during the pregnancy was collected. At the end of the baseline visit, mother-infant dyads were randomly assigned to either the intervention or control group. Research assistants who were unaware of the intervention status of the mothers and infants conducted all evaluation visits in a hospital clinic. At 6, 12, and 18 months post partum, mothers and infants were seen for evaluation visits. Trained research assistants administered the BSID to the infants and the drug form to the mothers. All mothers were given information on drug treatment programs; however, treatment was not mandatory to participate in the study. To control for differences in reading ability, the research assistants read all the questionnaires to the mother at every visit. Mothers were paid for each clinic evaluation visit and given bus tokens to get home. Only data relevant to this article are reported herein. Statistical analyses were performed using SPSS 11.0 statistical software (SPSS Inc, Chicago, Ill). Analyses in this article are based on the intention-to-treat model rather than the amount of intervention received, because this method provides a conservative estimate of the intervention effect.17 Thus, mothers who were randomized into the intervention group were retained in that group, even if they refused all intervention (n = 1). Analysis of variance and χ2 analysis were used to determine if there were any group differences on demographic, perinatal, and drug use variables. Correlation analyses were used to determine significant relationships among the variables. Two repeated-measures analyses of covariance were performed with developmental scores at 6, 12, and 18 months as the dependent variables. Analyses were performed separately for the BSID MDI and PDI scores. In both analyses, there were 2 between-subjects factors—group (control vs intervention) and maternal report of ongoing cocaine and/or heroin use (no vs yes)—and 1 within-subjects factor—administration time (6, 12, and 18 months). Infant weight (small for gestational age) and maternal report of days of prenatal cocaine and cigarette use were used as covariates. These analyses simultaneously tested several main effects (group, ongoing cocaine and/or heroin use, and time) and interactions (group by ongoing cocaine and/or heroin use, group by time, ongoing cocaine and/or heroin use by time, and group by ongoing cocaine and/or heroin use by time) for MDI and PDI scores separately. The present study included 108 families (54 control, 54 intervention). Originally, 258 families were enrolled for randomization to either the control or intervention groups. Thirty-one dyads were lost to follow-up before the 2-week baseline visit (Table 1); therefore, 227 dyads were randomly assigned to either the intervention (n = 114) or control (n = 113) group. An additional 32 families (19 control, 13 intervention) were lost to follow-up after the 2-week visit (Table 1). Most of the families lost to follow-up after the 2-week visits were lost before the 6-month visit. The 6 families lost to follow-up between the 6- and 12-month visits were lost because the infants were removed from the custody of their biological mothers and the new caregivers chose not to continue in the study. Finally, noncompliant families were families who missed multiple scheduled visits (Table 1). There were 195 families (95 control, 100 intervention) seen for at least 1 of the 3 clinic visits during the first 18 months post partum. Thirty-three families (12 control, 21 intervention) were excluded from this study because they did not have data at all 3 time points. There were 162 families (83 control, 79 intervention) seen at all 3 time points, providing a retention rate of 63%. In this study, we were interested in ongoing maternal drug use and infant outcome. Therefore, 37 families (22 control, 15 intervention) were excluded from the study because someone other than the biological mother had cared for the infant during the first 18 months post partum. Sixteen families (7 control, 9 intervention) were excluded because the prenatal drug form was not administered to the mother; therefore, maternal prenatal drug data were missing. Finally, 1 intervention family was excluded because severe eye problems prevented the child from seeing the Bayley objects (the mother was noncompliant with optometrist appointments). Families included in this study are a subgroup of a larger population from an ongoing study. Mothers included in this study were older at age of entry into the program than mothers not included in the study but who were part of the larger population (P<.001) (excluding those families lost before randomization) (Table 2). Infants included in the study had higher 5-minute Apgar scores than infants not included in the study but who were part of the larger population (P = .002) (Table 2). Most mothers described in this article were single, unemployed, African American women with less than a high school education. However, control mothers were more likely to be single than intervention mothers (Table 3, P = .05). Most infants in the study were healthy, full-term infants, with a little more than 50% being female. However, control infants were more likely than intervention infants to be small for gestational age (Table 3, P = .03). Entry into drug treatment was assessed at the 6-, 12-, and 18-month visits. There were no significant group differences in the number of mothers reporting entering drug treatment during the first 18 months post partum. There were 17 control mothers and 23 intervention mothers who entered treatment. Drug treatment was not significantly correlated with any of the dependent variables; therefore, it was not used as a covariate in later analyses. None of the mothers in the present study reported using amphetamines, barbiturates, or hallucinogens during pregnancy, and fewer than 4% of the mothers reported using tranquilizers. Therefore, these drugs were excluded from the analyses. Research indicates that the effects of prenatal drug use on infant outcome may be dose related, such that heavier amounts of prenatal drug exposure are associated with more negative developmental outcomes.5,18-20 Therefore, using maternal report of frequency of drug use on the 2-week drug form, days of drug use during the last 6 months of pregnancy were calculated for each drug. Intervention mothers reported marginally higher cocaine use (days) in the last 6 months of pregnancy than control mothers (Table 2, P = .06); therefore, prenatal cocaine use (days) was used as a covariate. A correlation analysis was run to determine if any MDI or PDI scores were correlated with any other prenatal drug use. Maternal report of prenatal cigarette use (days) was significantly correlated with 6-month MDI scores (r = −0.24; P = .01); therefore, prenatal cigarette use (days) was used as a covariate. Maternal report of ongoing drug use was collected at the 6-, 12-, and 18-month clinic visits. Mothers who reported using cocaine and/or heroin at any visit were given a score of 1. Mothers who reported no cocaine and/or heroin use at any of the 3 visits were given a score of 0. Ongoing alcohol and marijuana use were calculated the same way. The χ2 analyses revealed no significant group differences among control and intervention mothers in reporting ongoing cocaine and/or heroin use, ongoing alcohol use, or ongoing marijuana use (all P>.18). A correlation analysis was run to determine if ongoing alcohol use or ongoing marijuana use was correlated with MDI or PDI scores. None of the correlations were significant (all P>.09); therefore, ongoing alcohol and marijuana use were not used in later analyses. In the first repeated-measures analysis, the dependent variables were the BSID MDI scores at 6, 12, and 18 months. Table 4 presents the means and SDs for the MDI scores. Significant effects of group (P<.001), time (P<.001), and ongoing cocaine and/or heroin use (P = .05) were found; all the interactions were nonsignificant (P = .13). The group effect indicates that MDI scores were higher for intervention infants than for control infants. The ongoing cocaine and/or heroin use effect indicates that MDI scores were higher for infants whose mothers reported no ongoing use than for infants whose mothers reported ongoing use. The time effect indicates that MDI scores decreased over time. In the second repeated-measures analysis, the dependent variables were the BSID PDI scores at 6, 12, and 18 months. Table 4 presents the means and SDs for the PDI scores. A significant effect for group (P<.001) was found; all other main effects and interactions were nonsignificant (P>.09). The group effect indicates that PDI scores were higher for intervention infants than for control infants. Finally, prenatal cocaine use (days) was a significant covariate (P = .005). Among drug-exposed infants living with their biological mothers, a home intervention led to higher BSID MDI and PDI scores during the first 18 months post partum. Other researchers3,12 also found that an intervention led to higher BSID scores during the first year post partum among drug-exposed infants. In the present study, the intervention seemed to have the greatest effect on infants whose mothers reported no ongoing cocaine and/or heroin use after the infant was born. Intervention infants living in drug-free homes consistently scored above the mean on the BSID MDI and PDI through 18 months. The data in the present study must be interpreted with caution. First, only families in which the infant was discharged at birth into the mother's care were included. These drug-using mothers who were able to retain custody of their infants may have been "doing better" in some way so that it was believed that they were capable of caring for their infants. Second, the mothers volunteered to participate in the study; therefore, this group may not be representative of all drug-using mothers. Third, the study only included infants who remained with their mothers. Infants who remained with their mothers may have been developing at a normal rate as opposed to those infants who came to the attention of social services and were removed from the mother's custody. Fourth, there were some significant group differences between those mothers and infants included in the present study and those who were not. Finally, both prenatal and ongoing maternal drug use was based on maternal report. 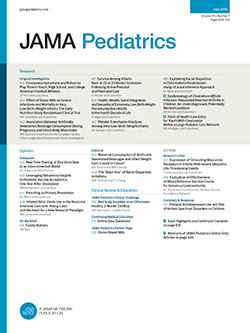 However, maternal self-report scales are low in cost, readily available, generally well standardized, and easily administered.23 Although there were no statistically significant differences in reporting of drug use between the control and intervention groups, there may be clinically significant differences in reporting that may confound the association between intervention status and developmental outcome. In summary, a home intervention with drug-exposed infants and their mothers leads to better infant cognitive outcomes through 18 months post partum. However, the intervention was most effective among drug-exposed infants whose mothers reported no ongoing cocaine and/or heroin use after the birth of the infant. Drug addiction is a chronic relapsing disease. Future investigators need to consider this and design intervention programs that include a drug treatment component. Corresponding author and reprints: Maureen E. Schuler, PhD, Department of Pediatrics, University of Maryland School of Medicine, 655 W Lombard St, Suite 311, Baltimore, MD 21201 (e-mail: mschuler@peds.umaryland.edu). Accepted for publication August 24, 2002. This study was supported by a grant from the National Institute on Drug Abuse (DAO7432), Rockville, Md. This study was presented at the annual meeting of the Pediatric Academic Societies, Baltimore, Md, May 1, 2001. Few researchers have examined the association between ongoing maternal drug use and infant developmental outcomes among drug-exposed infants. Interventions with drug-exposed infants are often associated with better developmental outcomes during the first year post partum. Ongoing maternal drug use was associated with poorer developmental outcomes among drug-exposed infants at 18 months post partum. A home intervention led to better developmental outcomes through 18 months post partum.